It is well understood that organisations such as NEBOSH (The National Examination Board in Occupational Safety and Health) and CIEH (the Chartered Institute for Environmental Health) offer standardised Health and Safety Training following a qualification path leading to membership and recognised letters after a person’s name. It is even now possible to become a Chartered Health and Safety Practitioner! But where does this leave specialism and technical competence? 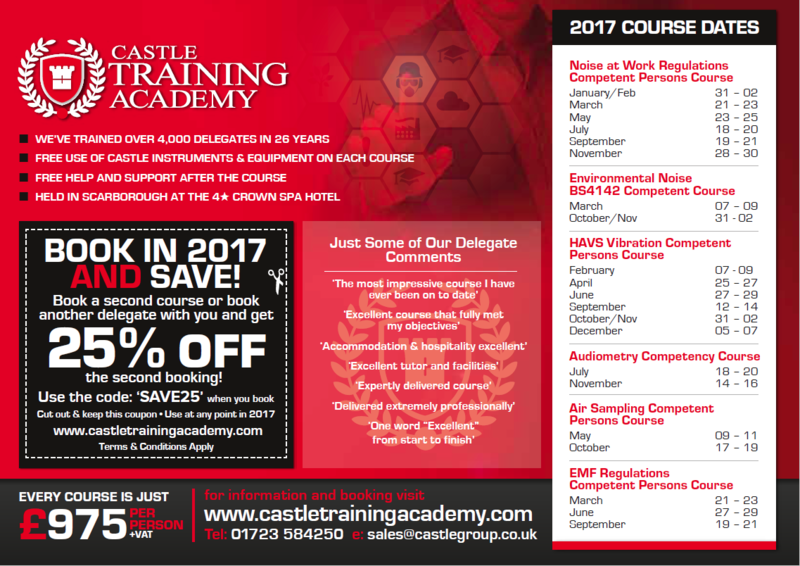 If you were to talk to a handful of delegates on a Human Vibration or Noise at Work Competence course run by the likes of Castle Group Ltd, many of them have already taken the likes of a NEBOSH certificate or diploma. Their reason for attending will be to gain particular skills in technical subjects like Noise, Vibration or Electromagnetic Field Regulations. It soon becomes clear that generalised qualifications in safety spend very little time on any one subject, relying on practical experience and the discretion of the practitioner to go forth and acquire the knowledge independently. Without doubt, there are good competence based courses available, and these courses have an important role to play. They can provide in-depth, application based skills and knowledge to either supplement a more formal qualification or just to build up enough areas of expertise to get the job done. Choosing the right course comes down to using whatever information is available about the training provider or the course in question. It is important with specialist training like this, that the provider has a background in the subject matter; this can give the course more depth, better access to equipment and good post-training support. It is also a good idea to check out the past record of the provider by asking around – your local inspector might even have some words to say! The whole point of a competence course is to assess the delegates ability to do the job, and in this way, exams are not usually the best approach. This leaves course based assessment or work-based assessment or, perhaps a mixture of both. Work-based assessment would ideally involve a tutor overseeing the delegate in the workplace and assessing the processes used. As this is not very practical, it is usually in the form of a project carried out after a course using real-life data and situations. This would lead to a report, which is marked as if it were being viewed by an outside authority (e.g. a factory inspector). A question often asked of training providers is what accreditation a course has. In the case of competence courses, there is no such thing. Just because one course is run by an institute and another run by a private, commercial organisation, this does not mean either has accreditation in itself. Accreditation for the organisation is available from Qualifications and Curriculum Authority (QCA), but this is not industry, or subject specific, but accredits the way the organisation runs it’s training (a similar scheme to ISO9001 for quality management). The current state of play in the UK is that not one organisation (of those contacted) is able to offer accreditation for external competence based courses. Without some form of accreditation, the field is open to less-than-scrupulous training providers and could be leaving many delegates with a false air of confidence in their level of competence! In conclusion, competence courses can be vital in filling in the knowledge gaps, but they are not regulated and can, therefore, vary enormously. When looking for such technical courses, ask the provider how long they have been going, how many delegates pass through their hands and perhaps even ask your local inspector if they’ve heard of them!